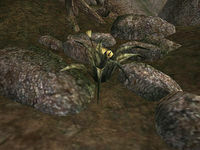 Kreshweed is a coarse grass that grows throughout Morrowind and particularly in the Azura's Coast and West Gash regions of Vvardenfell. Kreshweed may also be found less commonly in other regions of Tamriel. It grows with especially great abundance near salt water. Kwama Cap is a rare fungus that can be found in the Stonefalls region. Aptly named, this mushroom is known to grow in places such as the Strifeswarm Kwama Mine. It can be used to promote plant growth in certain rituals. A species of flower known for its healing properties. In particular, it can help to reduce fevers. A rare plant whose delicate flowers are said to have magical properties, particularly involving purification. 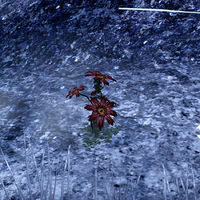 The plant is said to grow where the tears of the goddess Kyne fall to the earth. 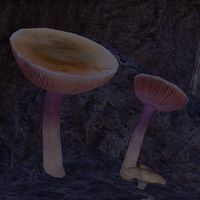 It is normally found in Skyrim, but some specimens have been sighted growing in Coldharbour near a shrine dedicated to Kyne which was stolen from Nirn. The flower is normally invisible but a runestone which is considered blessed by the goddess allows them to be seen. This page was last modified on 2 February 2019, at 09:51.